The Wall Street Journal had a great article about Freemasonry recently. ST. PAUL, Minn.—No self-respecting secret society can get by without a Facebook fan page anymore. That’s transparently true of the Freemasons, renowned for their medieval blood oaths, their often-alleged plot to create a New World Order, their locked-door conclaves of U.S. presidents and power brokers and their boring pancake breakfasts. A menagerie of 19th-century civic and social brotherhoods, and their attendant sisterhoods, lives on around the globe: the Elks, the Moose, the Lions, the Odd Fellows. Freemasonry is the oldest of all, still the biggest, and—in the public mind—about as penetrable as the mythic crypt beneath the ninth vault of Solomon’s Temple. Secrecy gives Masonry its mystique. Yet the Masons have lately realized that they’d be lost in oblivion if it weren’t for the Web. It was Thursday evening, almost time for fellowship night at the “very young” lodge he finally did join: Braden No. 168, housed on a shady street in a columned temple the Masons built in 1910. Mr. Gallagher is 32 years old and between jobs. 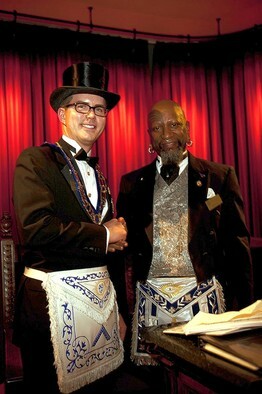 He was initiated by Braden in 2009, rose to Master Mason and now is lodge education officer. It’s a post that didn’t exist for 290 years after Masonry came out of its historical shadows, in 1717, as a London club for enlightened gentlemen. Mr. Gallagher’s Masonic tag, if his digital function had one, might be Worshipful Webmaster. Credit goes to Chris Hodapp of Freemasonry for Dummies for finding this article. This entry was posted in Freemasonry In The News. Bookmark the permalink.